가나자와, 일본의 굿 네이버스 호스텔 | 호스텔월드에서 예약하세요. Any cancellation after making a payment will incur the first night charge. Thus any cancellation received within 14 days prior to arrival date will incur the full amount of charge. PLEASE MAKE A PAYMENT BY CREDIT CARD IN ADVANCE. 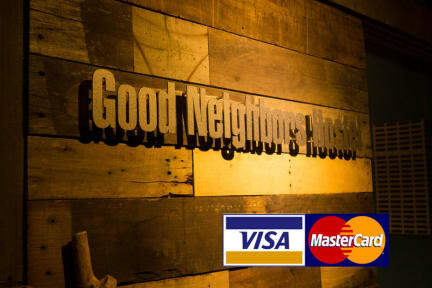 BY ALLOWING US GOOD NEIGHBORS LLC TO MAKE A PAYMENT BY YOUR CREDIT CARD, YOU SHALL BE DEEMED TO HAVE AGREED TO OUR CANCELLATION POLICY. 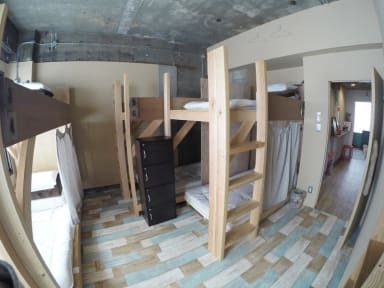 Good Neighbors Hostel은 카나자와에 있는 배낭여행객 전문 호스텔입니다. 40년됐던 건물이 심플한 디자인의 호스텔로 탈바꿈하였습니다. 혼성 도미토리룸, 여성 전용 도미토리룸, 그리고 더블룸(3개)을 갖추고 있으며 전 층에서 와이파이를 무료로 사용할 수 있습니다. 샤워실 및 화장실은 공용입니다. 1) 신용카드 결제는 불가합니다. 반드시 현금으로 결제해 주세요. 3) 호스텔 전 구역에서 금연입니다. It was very nice! Staffs were very kind and nice. Also at 9pm, you can get free plum wine which makes easy to talk other traveler. I definately come to this hostel again if i came to kanazawa later. I don't wanna recommend this hostel because this hostel's good thing only close from station and good staff. When i stay this hostel, i could't slept because of too noise every night. The staffs work from 8am to 8 or 9pm after that time started party for tourists. If you wanna join there, it will be good time but for me i wanna rest at my place so i can't rest at hostel.